Sometimes my kids don't listen to me. Okay a lot of times my kids don't listen me. Okay, okay, most of the time my kids don't listen to me. Everyday the only way my kids move off the couch is because I yell at them. Oh, I tell them breakfast is ready in a soft, even cheery tone maybe five times. Not one of them budges. Maybe I get a nod from the oldest, but he stays on the couch. Then something takes over and I turn into Sam Kinison and start screaming "BREAKFAST IS READY, COME AND GET IT!" All the kids come running. They aren't upset, they just come running into the kitchen to eat their breakfast. And I am not mad either. It is simply the only tone of my voice that registers with my children as a call of action. We end up eating breakfast together and go about our day. The Sam Kinison in me comes out off and on all day and night. I feel nuts. My mother was never really a yeller, not that I can remember. My mother was a storybook mom for a little kid. She baked amazing cakes, sewed our clothes, played games, sang silly songs. 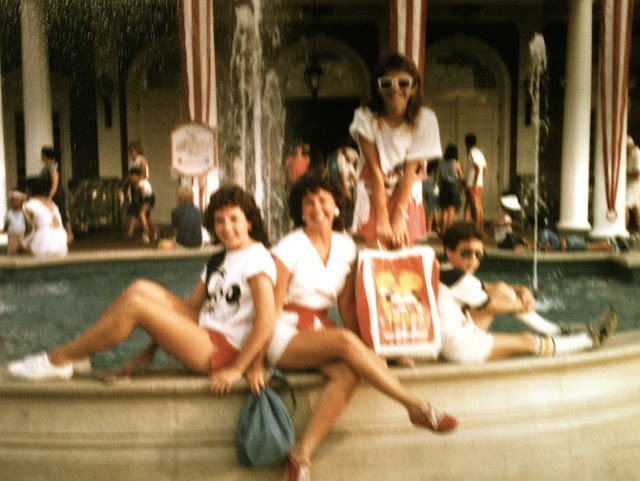 My mother hamming it up with me and my very fashionable siblings. She didn't work. Her job was making sure me, my brother and my sister were happy. And we were. Until she went crazy. Crazier than Sam Kinison. My mother was and is a stereotypical southern troubled woman. Think Vivi Walker in "The Divine Secrets of the Ya-Ya Sisterhood" or any woman in a Pat Conroy novel. They all start out charming, quirky, wild, fun. Then it goes wrong. Tragically wrong. My mother had this fabulous quirkiness and spontaneousness about her that made everyone fall in love with her. She would bring out her baton from her high school majorette days and twirl in the front yard until all the neighbor kids would sit in a circle around her. She was in heaven and my siblings and I looked on with pride. "She is our mom!" Our chins resting in our fists as we looked up at her and beamed. She choreagraphed the dance numbers in elementary school talent shows, she told off bullies down the street, she sang Kenny Rogers or SuperTramp at the top of her lungs with a wooden spoon, nightly. She was the woman that wouldn't let us call Cokes "pop" because it was too "Yankee" when we moved to Michigan. She is also the woman that I saw cry like it was a close relative when the University of Alabama football coach Bear Bryant died. She was fun, compassionate and kooky. But a head injury, a heartbreaking divorce, mental illness and a crippling drug addiction all made her become not the mom every kid on the street wanted. There were signs when we were little, signs that she might not be right. But we chalked that up to her most-of-the-time loveable quirkiness. Like when a storm came through. As the thunder was rumbling she would look at us youngsters and say "Do you know what that sound is? It is the devil beating his wife." And she would laugh like she told the funniest joke. She wasn't able to keep many long-term friends or a job either. She would look at me when I was having fun and say, "You mark my words, you will be crying before bedtime." And damn it she was usually right. Her words haunt me. I quoted her the other night to my husband. "That crazy lady was right, I always cry when I am happy," I told him. As I scream at my children, I wonder what they think of me. I also wonder if I am on borrowed time. Am I wired wrong like my mother? Does the happy/crying thing mean I am manic depressive? If I am crazy I want to be bipolar 2 like Catherine Zeta-Jones. It seems so much more dignified. Of course I am scared but I am determined to not let the scariness of mental illness govern how I live, most days. And I also vow to screw my kids up in totally different ways. And in the meantime, I will enjoy my heritage of being a quirky, fun mom. One who needs to yell like a dead, somewhat obnoxious comic to get anyone to listen. Not that funny, but you get the idea of Sam if you don't remember.